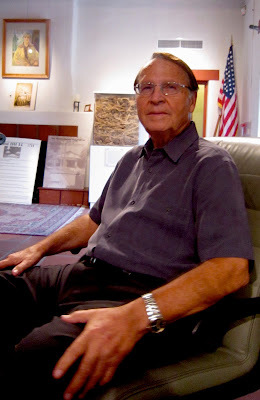 As part of The Museum of the San Fernando Valley's "Narrating Lives - Oral Histories of the San Fernando Valley", Guy Weddington McCreary was interviewed this May at historic Campo de Cahuenga in North Hollywood. Funded by the Cultural Affairs Department of the City of Los Angeles, The Museum's oral histories project is building an archive of interviews of men and women who have made significant impacts on San Fernando Valley culture and history. Guy Weddington McCreary was born and raised in the San Fernando Valley. He is a descendant of Wilson Weddington, the founder of North Hollywood (once called Lankershim). Guy attended Lankershim Elementary School and North Hollywood High School. His memories include the World War II era and observations of a Valley that experienced an explosion of growth during the 1950s and '60s. Among his significant achievements was being the Executive Director of the Republican Party for Los Angeles County in the 1970s. As the president of the Campo de Cahuenga Memorial Historical Association, Guy McCreary was instrumental in saving and restoring the Campo for future generations.